Something new and different this week. 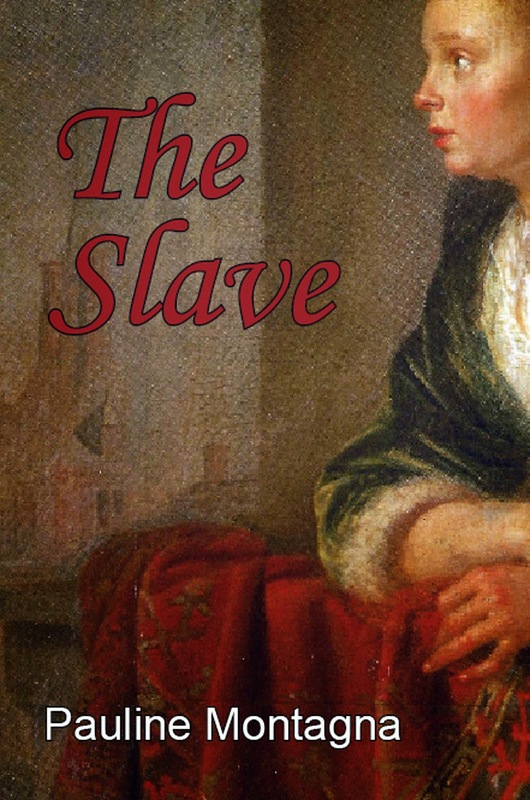 Pauline Montagna, who had planned to participate in the Writing Process Blog Hop on March 31, has organized a blog tour to celebrate the release of her novel The Slave, pictured here. You’ll find more information about the book, Pauline, and her website—including a time-constrained offer for a free e-book—at the end of the post. The Slave is set in Renaissance Italy, where, as Pauline notes, dueling in the sense that most of us think of it first developed. The judicial duel was known in medieval Russia, too, but the duels of honor described in Pauline’s post did not exist there at that time. The custom, imported from the West like so much else after the reforms of Peter the Great (1682/89–1725), took hold in Russia in the early nineteenth century. Alexander Pushkin’s novel in verse Eugene Onegin is arguably the most famous literary example of the trend. Tragically, Pushkin himself died in a duel defending his wife’s honor in 1837. And now, take it away, Pauline! The Italians invented the duel of honor during the late Middle Ages and Renaissance and were the most prolific both in resorting to such measures and in their writings on the subject. For Italians, a duel was not just a fight between two men but a highly sophisticated and formalized judicial procedure defined and regulated by a set of rules as complex and binding as those of any court of law. In fact, the first treatises that appeared on the subject of dueling, as early as the fourteenth century, were written by Italian jurists. The duel of honor grew out of practices that date back to the most distant historical times. The earliest type of duel was the state duel, where representatives of opposing armies or factions would decide the winner in one-to-one combat between champions. The judicial duel dates from the Dark Ages and was introduced into Italy by the Lombards. This state-sanctioned duel would be fought to determine the guilt or innocence of a man accused of a crime. The accused would fight his accuser under the auspices of his lord who would decree the appropriate punishment for the loser, be it the accused who would have to suffer for his crime or the accuser who would be punished for perjury. By the twelfth century, the judicial duel had fallen into disuse, but out of it had grown the duel of honor, fought now to prove or disprove an accusation of a dishonorable act. Duels could also be fought to acquire fame, out of sheer hatred, and, of course, over the love of a woman. However, it was only the formal public duel fought on a point of honor that was considered ethical and justifiable. Though tacitly endorsed by both state and church authorities, official canon law decreed all dueling unlawful and deemed the losing party a suicide and the winner a murderer. The duel would begin with an accusation or an insult. The offended party would then challenge the other to a duel. Which party was the official challenger could sometimes be disputed if, perhaps, several insults were exchanged, or the duel was deliberately provoked by a man who considered himself already injured. Their friends would beg them to fight only as a last resort and find a peaceful solution such as an apology or a retraction, or by providing proof of the accused party’s innocence or guilt, for no duel could be fought over a manifestly true accusation. Duels of honor could be fought only among the nobility and knights. It was considered dishonorable to challenge a man of lower rank. A man of lower rank could challenge one of higher rank, but the man of higher rank had the privilege of refusing the challenge. While a challenger would be expected to fight on his own behalf, the challenged party could bring in a substitute, except in the case of an accusation of a crime that could incur the death penalty. One could also fight of behalf of an injured party that was unable to defend themselves. The challenged party had the choice of arms, though, as noted earlier, which party had that right might be disputed. When there was any doubt, the choice would go to the offended party. The parties must find a suitable field on which to fight, then ask permission of the local lord to hold the duel. The duel would be presided over by a judge, who would be either the local lord or a man chosen by both parties. After trying to bring about a peaceful resolution, the judge would ensure the duel was fought according to the rules and declare the winner. A practice which originated in Italy was the calling in of seconds or padrini. Preferably men of experience, moral courage, justice, and urbanity, the seconds’ duties were to inspect the field and the opponent’s equipment, ensure his principal received his rights and seek to resolve any questions in his principal’s favor even if this led him into a dispute with the opposing second, a dispute which might also be resolved by a duel on a later date. Seconds might also be called on to avenge their principal’s death. Before the duel could be fought, the judge had to ensure physical equality between the opponents. This might involve fasting or bloodletting by the stronger man, or tying one arm up if the opponent was one-armed or covering an eye (some advocated putting out the eye) if the opponent was one-eyed. As the duel could also be fought on horseback and in armor, they, too, should be equivalent so that no man had an unfair advantage. If the duel was to be on horseback, the most honorable weapons were the halberd and the lance and on foot knives, daggers, and swords. Defensive equipment could also be used such as shields or cloaks, though the sword alone was the weapon of choice. Armor was considered an honorable option as only ruffians fought without it. The outcome of the duel was considered to be decreed by fortune and determined by one’s guilt or innocence. For this reason opinions differed on how the fight should be conducted. One school of thought decreed that it was acceptable for the duelist to take advantage of his opponent’s mishaps; others thought otherwise. 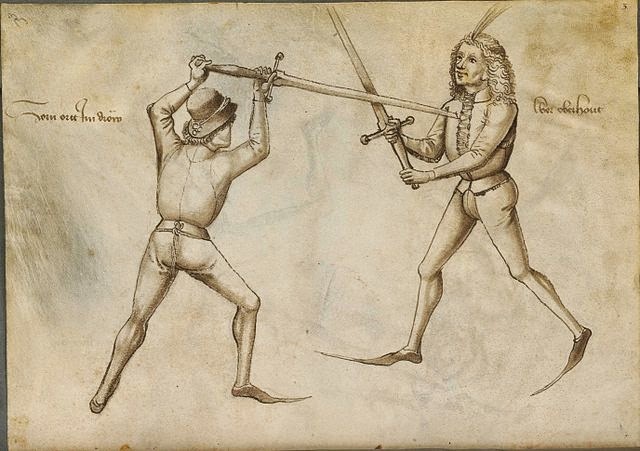 So while it was technically permitted to stab a man fallen to the ground, to attack one recovering his lost sword, or kill a wounded man, many thought it was only chivalrous to let the opponent recover his feet before continuing the fight. If a sword was bent or broken, the judge would decide whether it could be replaced. Unless otherwise agreed the duel would be fought to the finish, the point where either opponent died, or when one man recanted, surrendered or fled the field. If one opponent was in the power of the other and still refused to recant or surrender he could be killed, though an honorable man would spare the loser’s life. It was considered very bad form to pretend to surrender and then attack your opponent. If the fight ended in nonfatal injuries, or if both opponents died, it was up to the judge to decide the winner. The loser might have to pay a fine, forfeit his armor to his opponent, or even become his prisoner. Although not considered a slave or servant, an imprisoned loser would have to serve his conqueror, or if released on parole, promise to come and serve him when called upon. The winner might also turn his captive over to his lord, bequeath him to his heirs or demand a ransom. Now technically without honor, the loser might never be allowed to fight another duel, or only with the permission of his conqueror. Of course, not everyone followed the rules. If the opponents could not get their lord’s permission, or could not afford the expense of a formal duel, they might fight informally or alla macchia, in an out-of-the-way spot with no judge or rules. 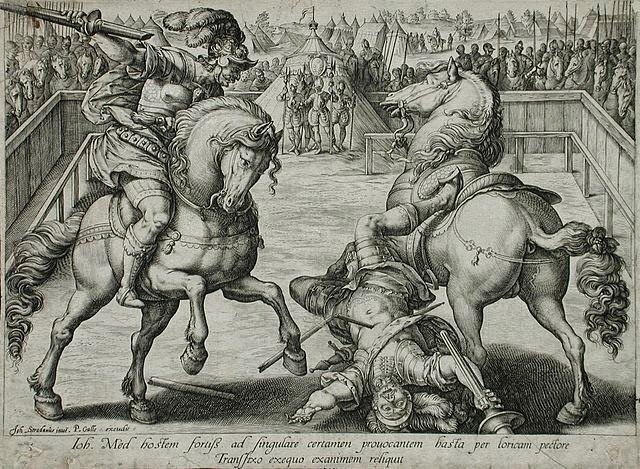 Unfortunately, despite their promulgation of the rules, Italians were reputed to flout those very rules with impunity, calling on cunning tricks and ruses to kill their opponents in whatever way they could, in ogni modo, maiming them or ambushing them afterwards. In my novel The Slave, the two men in the heroine’s life resort to a duel to settle the matter once and for all. Roberto saw that Baldassar, Batu, his second and a handful of men were already waiting for them in a patch of dappled, afternoon sunlight. Baldassar stepped forward when the Graziano party arrived, his brow creasing as he surveyed Lorenzo’s entourage of men-at-arms. The party dismounted and Lorenzo followed Baldassar to where Batu was standing, his sword resting jauntily on his shoulder, but his eyes cold. Aldo and one of Batu’s men stepped forward, sizing each other up. “To the death.” Batu’s voice rang out. “To the death,” Lorenzo agreed coolly. Pauline Montagna was born into an Italian family in Melbourne, Australia. After obtaining a BA in French, Italian and History, she indulged her artistic interests through amateur theater, while developing her accounting skills through a wide variety of workplaces culminating in the Australian film industry. In her mid-thirties, Pauline returned to university and qualified as a teacher of English as Second Language, a profession she pursued while completing a Diploma of Professional Writing and Editing. She has now retired from teaching to concentrate on her writing. She has published two books: The Slave, a historical romance set in medieval Italy; and Suburban Terrors, a short-story collection. Find out more about Pauline and her books on her website. If you join her mailing list by May 31, 2014, you can get your own free e-book copy of The Slave. These pictures are in the public domain because their copyright has expired. Great article, Pauline! There is also a duel in my novel, UPON YOUR HONOR, my newest historical romance. Thanks for the information. It's always good to know more about a topic. I will probably use dueling again in other books! Fascinating topic! Yes, and something only men could come up with!